Awesome circuit diagram program using on Mac, Windows and Linux similar to Visio. Use drag-and-drop interface and a large collection of standard circuit diagram symbols. Due to the high price tag of Visio, many people have turned to Visio alternatives for designing circuit diagram. There are many Visio replacements for Windows, but very few for Mac. That's why Edraw released its Mac version which helps people working on OS X design perfect-looking circuit diagrams. Edraw is a vector-based circuit diagram desktop software containing similar features with Microsoft Visio, which is used as a solid Visio replacement for making electrical circuit diagrams. It contains 20 libraries of standard circuit symbols and various starting templates. It's simple, fast and extremely easy to use. With it, even novices could make good looking circuit schematics. Drag-and-drop based interface to draw any kind of circuit diagram. Include a comprehensive collection of circuit diagram symbols, with vector format. Support automatic alignment and spacing. Snap and glue feature ensures effective connecting of shapes. Affordable price with a better service. Drag-and-drop is the most convenient way to make circuit diagram. Simply start the drawing canvas, open required symbol libraries and start drawing. Here is a simple guide. To view a detailed instruction, please refer to How to Create Circuit Diagram. Start Edraw, open a circuit diagram drawing page from the Engineering category. Some frequently used circuit diagram symbol libraries will open automatically on the left. To open more libraries, click the "Library" button and choose from "Electrical Engineering" category. Drag circuit symbols and use Connectors to connect the symbols. Lay out your circuit diagram by using smart guides and quick Align and Distribute buttons. Add a title and a background for your diagram. Export the file to a format your want. There are many export options including PDF, Word, Excel, PNG, Html, SVG, Visio, etc. 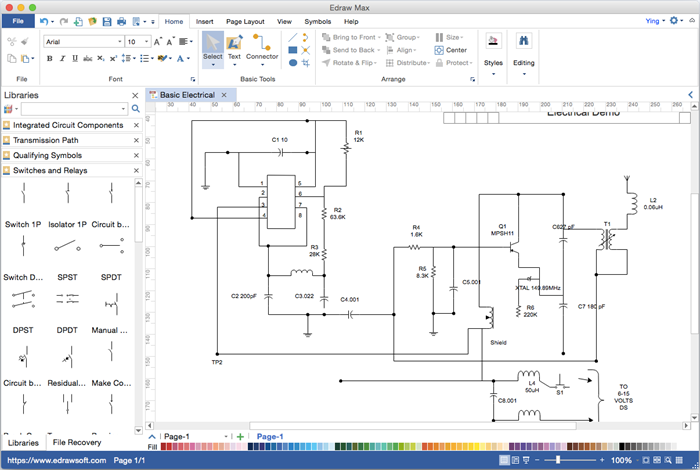 Discover why Edraw is the best software to create circuit diagram. Try Mac Circuit Diagram Software FREE.